« Beware this scary thing Excel can do to your data! The Ecological Society of America recently announced its call for nominations for awards for 2017. I encourage you to get out there and nominate people. In particular, consider nominating folks that are historically underrepresented. For the Early Career Fellows, consider nominating someone at a comprehensive university, primarily undergraduate university, or in the private sector. As an early career researcher, I feel a bit intimidated by the idea of nominating folks for the heavy-weight awards such as the Eminent Ecologist Award and MacArthur Award. But there are plenty of other ones to choose from, if you are an early career research like me. Last year, I nominated someone as an Early Career Fellow. While that person was not named a Fellow, those who were are quite impressive. In looking over the list, I began to think that maybe I had misjudged my nomination. It’s not that the person I nominated hasn’t done awesome things, but rather those who were named as Fellows were quite a bit more senior than my nominee. If true generally, this would be a big deal for nominators. Putting together a nomination for any of the ESA awards is fairly time consuming, and so it doesn’t make a lot of sense to try to nominate someone who is almost certainly going to be out of the running. So I dug into the data. 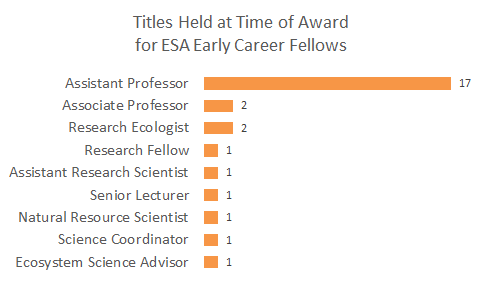 Specifically, I scoured the web for data on Early Career Fellows. Most have professional web pages. Many have CVs online. The rest have information on social media sites like LinkedIn. And my initial hunch was right. 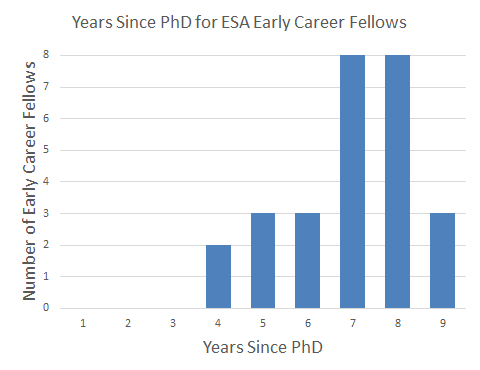 ESA states that Early Career Fellows must be non-students who are no more than eight years past their PhD degree date when they are selected. But all 27 existing Early Career Fellows were at least four years past their PhD degree date when selected, and 70% were at least seven years past their PhD degree date. I am not sure why 3 Fellows were 9 years past a PhD. My guess is that the time between nomination and award announcement (6-9 months) accounts for it. Either that, or 8 years isn’t a hard cut-off. Or the awards committee doesn’t bother to verify that nominees adhere to the 8 year limit. My nominee, by contrast, had received a PhD fewer than four years earlier. I interpret this to mean that the awards committee for Early Career Fellows looks at all nominees on an even playing field, without accounting for career length. An alternative way potential fellows might be judged is to account for time since PhD. For example, NSF committees judging applicants for the NSF Graduate Research Fellowship are supposed to take into consideration whether applicants are not yet in graduate school, are first year grad students, or are second year grad students. This is because we would expect differing levels of proposal sophistication among these groups, and it wouldn’t be fair to judge the best second year grad students against the best not-yet-grad-school applicants. Likewise, a great researcher with just dissertation work and a year or two of postdoc experience isn’t going to be competitive with a great researcher who has an additional six years of experience. I’m not necessarily advocating that the selection committee for Early Career Fellows should take into account time since PhD. There are pros and cons of doing so. I do hope, however, that ESA leadership understands how nominees are being judged and that it feels comfortable that the judging methods align with the goals of this honor. What this means for you as a nominator is that you should probably not bother nominating postdocs or other researchers in early temporary positions for this award. The most competitive nominees are going to be those six to eight years out from their PhD who have been in permanent positions for at least three years at the time of nomination. Speaking as an increasingly late-late-mid-career ecologist, I guess I’m surprised by the notion that the first 4 years of an Asst Prof appointment are “mid-career”. I know these terms are squishily (if at all) defined, but if mid-career starts then, there’s an awful lot of it. (I had a twitter exchange about this a while ago, and now can’t remember what I said; hope I haven’t reversed myself). Of course, that’s to some degree semantic. More generally: it is always the case and will always be that when a career award has a maximum time limit, candidates near that time limit will have an advantage (yes, this means I’m skeptical that ‘taking it into account’ as for NSF-GRF works unless there are quotas). I don’t think this means there’s no point nominating earlier, but it does mean we shouldn’t be surprised at all by the pattern in your data! Sorry, I guess I wasn’t clear. Fellows are named for 5-year terms. 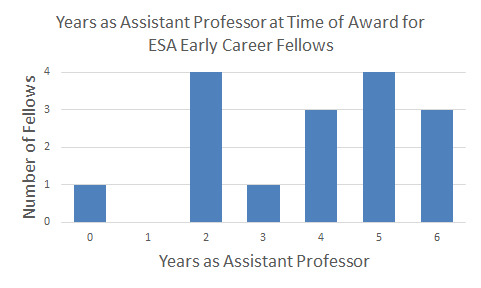 So if they are named at year 4 of being an Assistant Professor, then they spend the majority of their term as an Associate Professor (which I consider to be mid-career). Alternatively, if you consider that “early career” means up to 8 years post PhD, those who are named at years 7 or 8 spend 3 or 4 (respectively) years of being an “Early Career” Fellow as mid-career researchers.